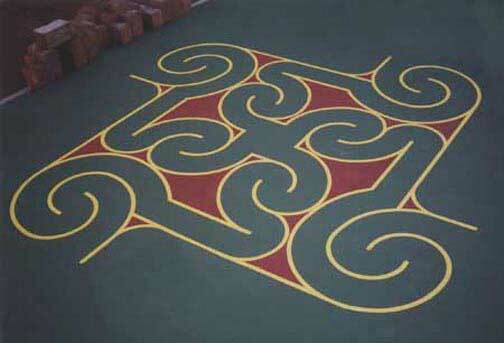 The pinwheel was painted on a tennis court surface in the middle of a playground in Chinatown on Sacramento between Grant and Stockton in San Francisco, California. On visiting the site, he received an image of a square design with four entrances and a center. One entered the design on one of the four sides, but entered the center from an adjacent side. That night he created the design and three years later he and Joan laid it out in half a day and saw it painted in a couple of hours. The design is 21 feet square and contains eight meander patterns. As a game, four people, at their own entrance, race to the center where they most leave by another route without touching anyone. First one out wins.